Hello!! I’m Janel the author extraordinaire (doesn’t that sound fancy?) behind the blog Nellie Bellie. 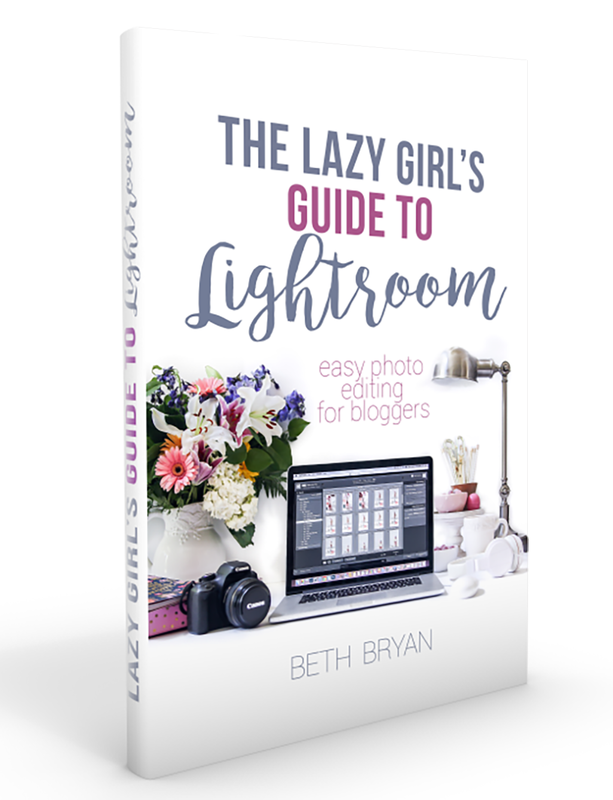 I’m so, so honored to be here at Beth’s blog. Her taste and style are stellar!! Add that to the fabulous person she is and you have a killer combo; I love killer combo’s! 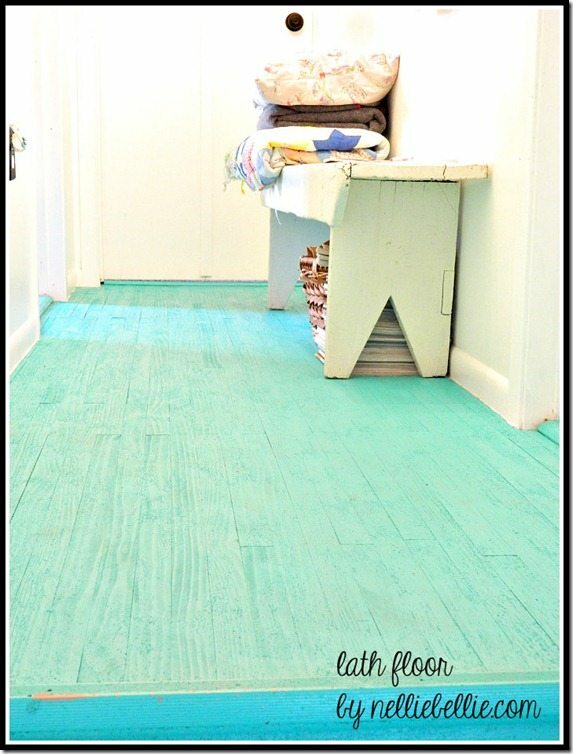 Beth has amazing home projects! 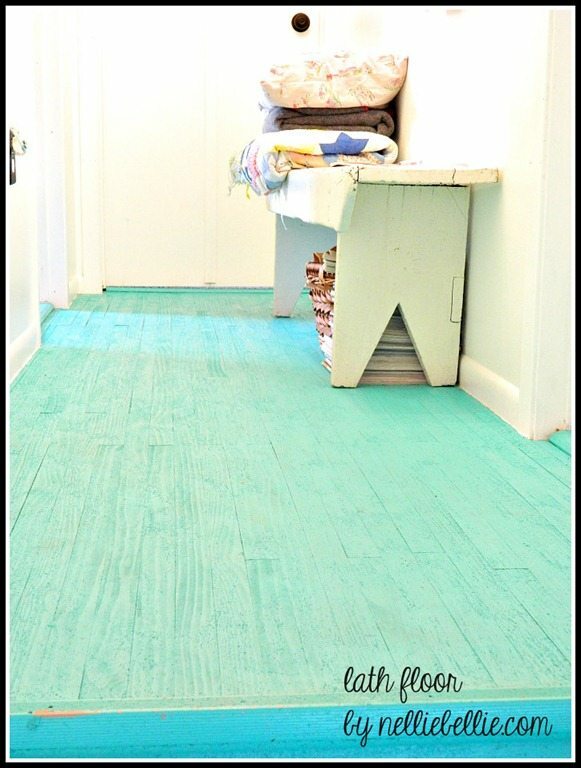 Her laundry room and kitchen are eye candy for the DIY’er. No joke. While I will never claim to have Beth’s stellar taste I wanted to share my favorite DIY that I’ve done in my home, my hall. My hallway was a sad, neglected bit of my home. 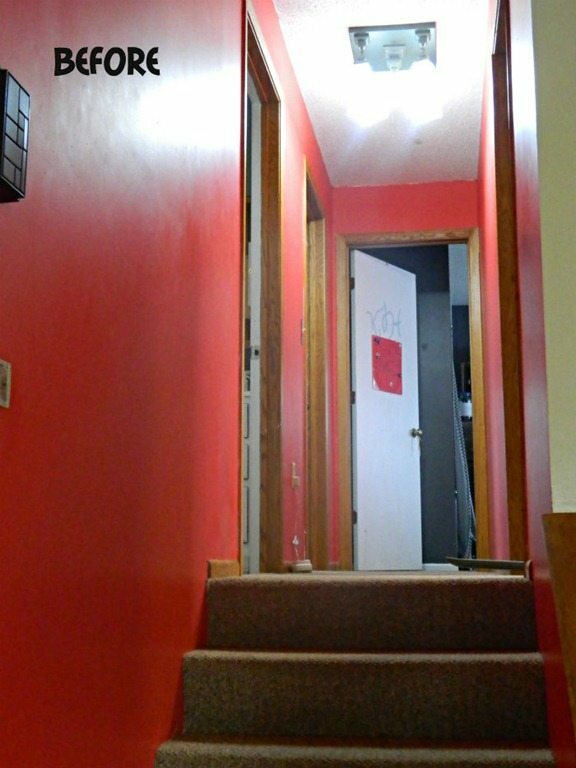 Red walls, oak trim, and horrible lighting. The whole thing. It was ruining my mojo. It’s amazing what paint can do to a sad space, isn’t it!!! I gave the builder-grade doors a bit of character with wood trim and spray painted the handles. 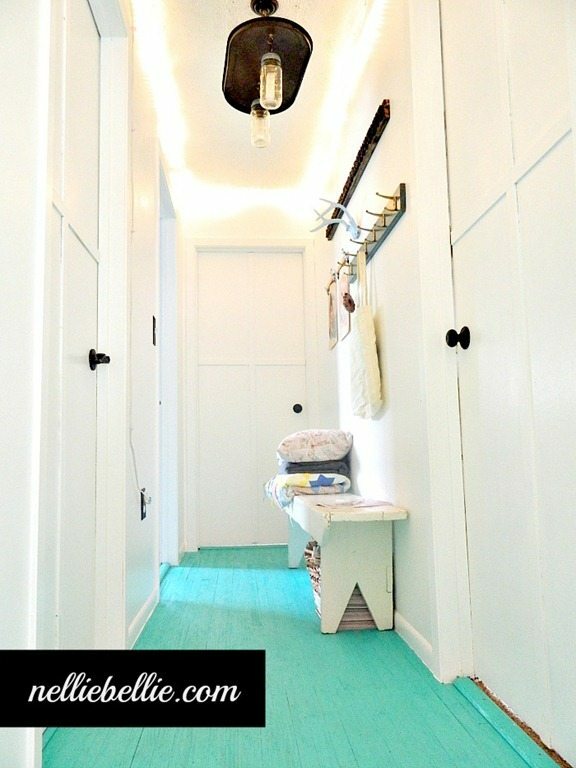 Bright white paint on the walls, doors, and trim bring the space to life. But the floor…the floor is the ultimate!!! And what a floor it is!! I built that baby. It’s built of lathe and covered in porch/floor paint in a fabulous color. That floor makes me happy. Each and every day I walk upstairs I grin. Something about aqua will do that to a girl. It’s just a smiling color! Be sure to stop over and see the complete post about my hallway including the tutorials to many of the projects you see here. And gosh, check out Beth’s laundry room and kitchen!! Beth, if you see a crazy lady doing her laundry in your home move on…move on. Looks fantastic! 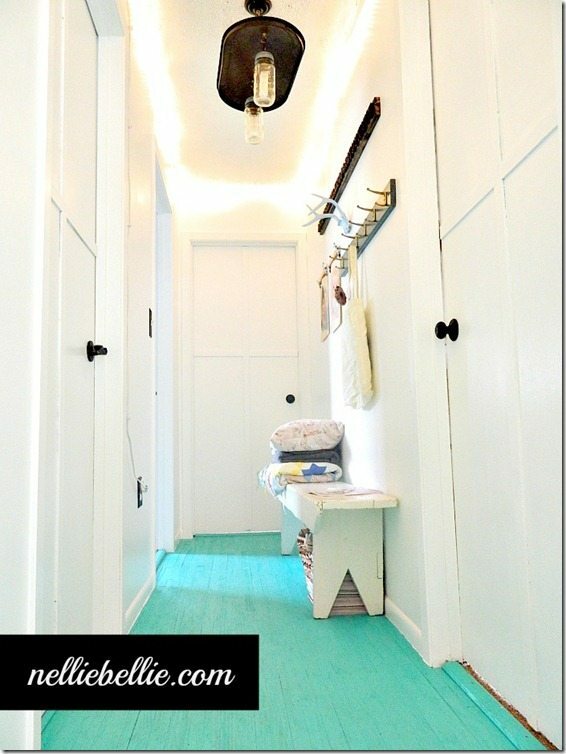 I love the bright white walls and the floor! thanks for having me Beth!! You Nailed that Floor– lol! Literally! 🙂 Love it girl! WOW! 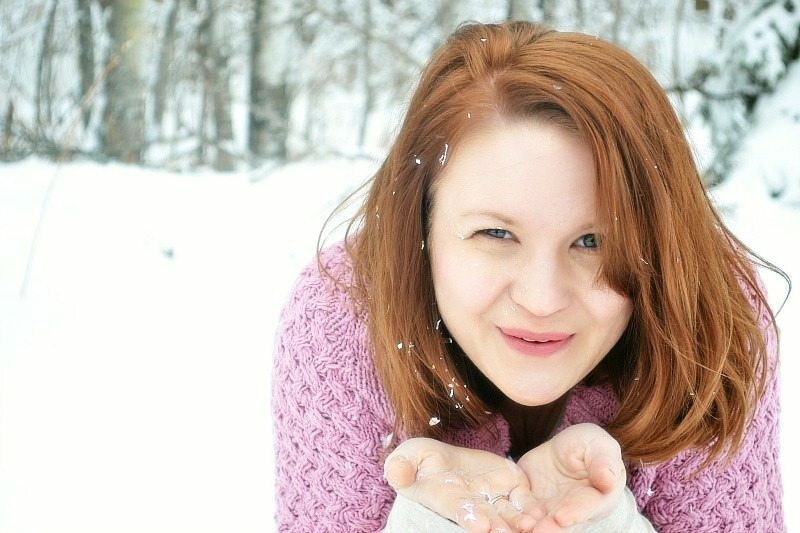 That is a beautiful transformation…So fun! AMAZING! Really, really a great job. I can’t believe that’s the same space!